Fishermen should never throw unwanted fish or scraps into the water. If you find a crocodile nest, get away from the area, mothers are very protective. Crocodiles are night hunters. They will attack during the day but they prefer to do their hunting at night. Stay away from the edge of any body of water where there might be a crocodile. This includes swamps, ponds, rivers, streams and the ocean. Keep your pets away from the area as well. 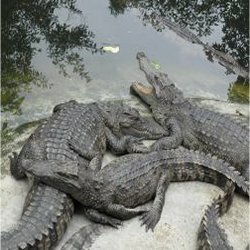 Not only is there the danger that your beloved animal may fall victim to one of these predators, your pet may inadvertently scare a crocodile into attacking or attract a hungry one. If you find a slide mark, which is a trail made by one of these animals entering the water, leave the area. Do not ever feed a crocodile. It does not matter how big or how small it is, do not feed it anything. Feeding crocodiles of any size teaches the crocodiles to associate people with food. Nobody wants crocodiles to think that if they approach someone they will get fed. This behavior pattern has been seen in other animals, especially in bears in North American national parks. If you do see a crocodile, move away slowly. Back away, do not turn your back on the animal. In most cases the animal will ignore you. If he does pursue, RUN. Do not run in a zig-zag pattern. This is an old wives tale. Run in a straight line away from the animal and the water. Yes, both crocodiles and alligators are surprisingly fast on land, however they tire quickly and are generally lazy. They will not pursue for long if you head away from the water. If you are camping in an area that might have crocodiles, make sure you stay far away from the water. Pitch your tent at least 50 meters away, further if you can. Do not for any reason go near the water after dusk. Avoid dangling arms or legs in the water. Crocodiles can jump out of the water. People have been attacked while in boats or climbing trees that hang over the water. Crocodiles and alligators are often startled into attacking. They may attack in self defense if you startle them. Make noise if you are in an area where there might be crocs. If you are attacked, Fight back!. Hit the crocodile in the nose or poke his eyes. If he does get a firm hold on you and gets you into a roll in the water, playing dead may be your best option. The animal may think that you are in fact dead and will release its hold. Crocodiles often attack and kill their prey but eat it later. Do not bother trying to pry a crocodiles jaws open. It’s not going to happen. This entry was posted in Animal Trivia and tagged alligator attacks, alligator trivia, Avoid Gator Trivia, crocdile attacks, crocdile trivia, escape crocdile trivia, gator tips trivia by Jane. Bookmark the permalink.